Once in a while, something ordinary grabs you. Here is an uncropped photo of the ceiling of an existing basement we are currently working on. 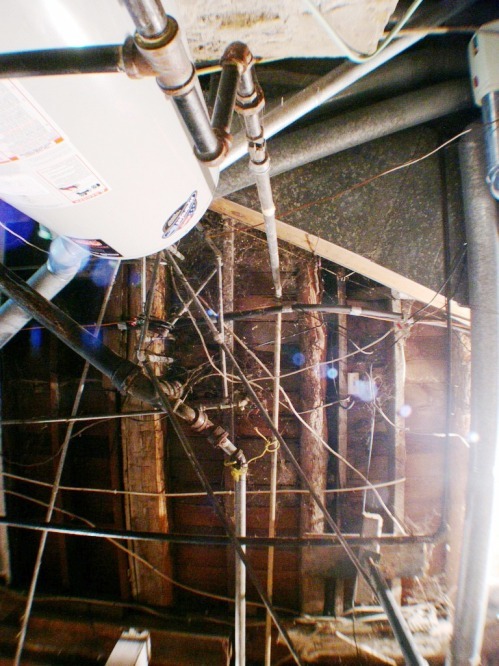 I laid our camera with the wide angle adapter on the floor to document the array of wires, pipes and joists. The lighting was poor in the basement, so I didn’t expect much from the photo. Like analog photographic development of old, I was surprized by how engaging the photo is when I pulled it onto the big screen at the office. The exaggerated perspective, variety of materials, composition of lines, and even the light splotches created a photo that really drew me in. Thought you might like it, too. An unexpected treasure found in everyday life. It may also be an example of the challenges faced in remodeling historic homes!